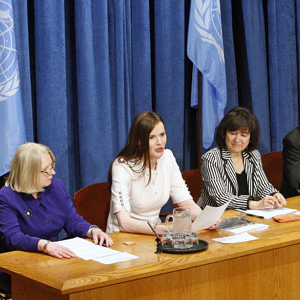 On February 22, 2010, Geena Davis delivered the closing keynote address during the United Nations Economic and Social Council (ECOSOC) special event: "Engaging Philanthropy to Promote Gender Equality and Women’s Empowerment." On February 22, 2010, Academy Award-winning actor and advocate Geena Davis will deliver the closing keynote address during the United Nations Economic and Social Council (ECOSOC) special event: "Engaging Philanthropy to Promote Gender Equality and Women’s Empowerment," which is being co-organized by the Department of Economic and Social Affairs (DESA), United Nations Development Fund for Women (UNIFEM), United Nations Office for Partnerships (UNOP), in collaboration with the Committee Encouraging Corporate Philanthropy (CECP). Ms. Davis is a partner with UNIFEM in the effort to change the way media represents women and girls, to encourage media to present and investigate issues of grave importance to women and to use a "gender" lens when reporting. As the founder of the non-profit Geena Davis Institute on Gender in Media (GDIGM) and its programming arm, See Jane, Ms. Davis brings her media expertise to advocate for gender equality and women’s empowerment. The event emphasizes the benefit of partnerships between the United Nations organizations, governments, he private sector and civil society, and highlights key examples of what can be accomplished working together. The programme, opened by United Nations Secretary-General Ban Ki-moon, feature leaders from the United Nations, global philanthropy, and private enterprise speaking on the crucial role of public/private partnerships in advancing gender equality and women’s empowerment. As the founder of the non-profit Geena Davis Institute on Gender in Media (GDIGM) and its programming arm, See Jane, Ms. Davis is a compelling choice to speak on gender equity and women’s empowerment. The mission of GDIGM is to engage and educate creators of media content for children with the message that stark gender inequities exist in media aimed at children. Davis strongly believes that gender representation matters in children’s media, and that having a fair representation of female characters would play a critical role in advancing gender equity and women’s empowerment.